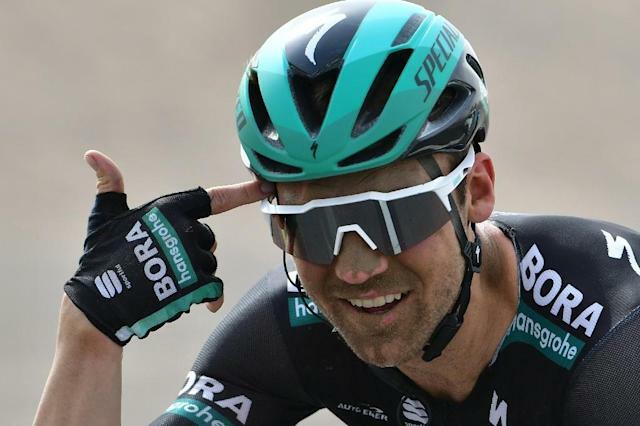 Zumárraga (Spain) (AFP) - Germany's Maximilian Schachmann of the Bora-Hansgrohe team won the 11.2km Tour of the Basque Country opening day individual time-trial on Monday. Fresh from a stage win at the Tour of Catalonia, Schachmann timed 17min 10sec to edge Dani Martinez of Education First and Sky's Michal Kwiatkowski by nine and 10 sec on rain slick roads with several short sharp ascents around Zumarraga. "I have no idea how I menaged to win this ahead of Alaphilippe and Kwiatkowski," he said after the race. "It's a verty special win because it's a very difficult win," he said. UAE's Dan Martin, Sky's Thomas and Kwiatkowski, Yates, Jakob Fuglsang and Movistar's Spanish hope Mikel Landa are amongst the favourites. "I'm fine, maybe just lacking a bit of rhythm," said pre-race favourite and runner up here last year Landa, who broke a collarbone racing in Mallorca in January.